As you may know, our son and his wife were here this past week from Seattle, Washington. We had a great visit. The day after the Open House, we had a family Christmas with them. Everyone was here and it was a lot of fun. We exchanged gifts with them, as they will not be here on Christmas day. 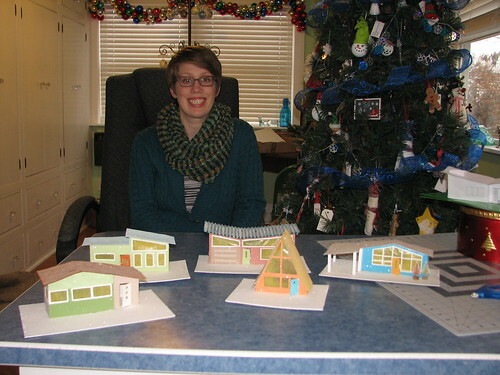 On Tuesday and Wednesday, my daughter-in-law and I spent a lot of time in the craft room, working on a project I started for her in December of 2012. Her favorite design style is mid century. 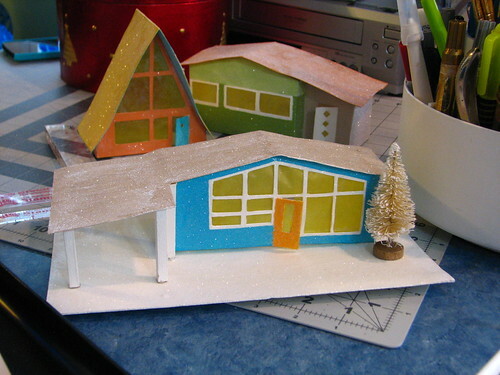 I had found three patterns on retrorenovation.com for mid century style Putz houses. 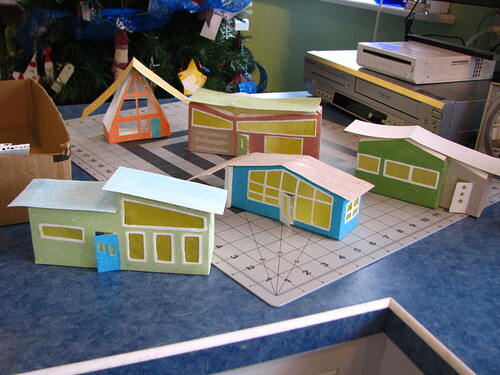 The site has nine patterns now and we’re going to make some of the other houses, too. I drew the other two patterns myself. These are the five houses as I left off with them two years ago. 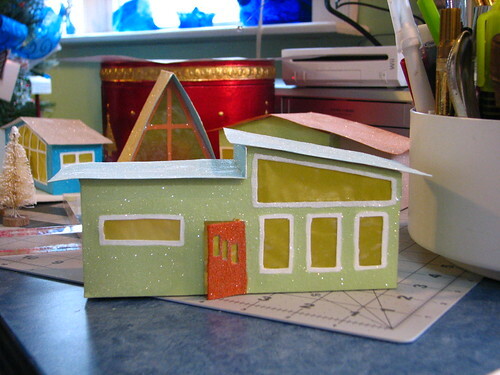 We put roofs on all of them and also attached them to bases. Julie began embellishing some of them. I drew the pattern for this house with the carport, using a picture I found online of a little mid century house in St. Louis. The link is here: http://www.beltstl.com/tag/mid-century-modern-ranch/. It’s the fourth picture on that site. I also drew a pattern for this house. I saw a gingerbread cookie online with this design. The link no longer works. 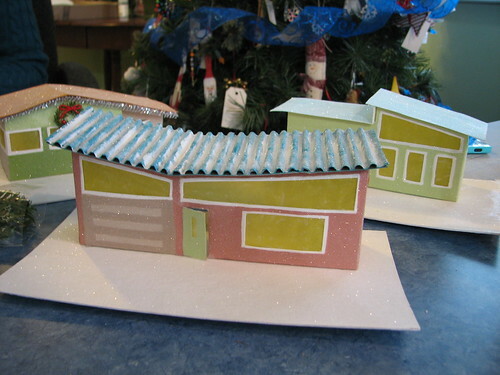 Julie came up with the idea of the corrugated roof. So cute! 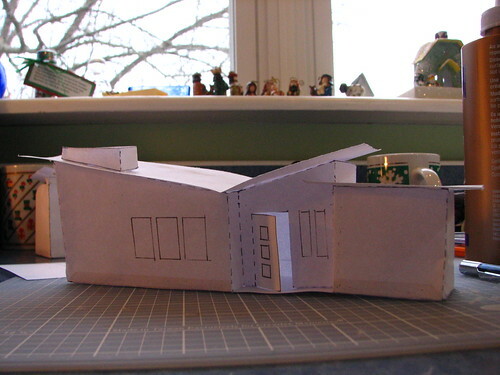 I made a paper mock-up of the butterfly ranch house. We didn’t make this one in cardstock yet, but Julie took the pattern home with her. Now they’re ready to pack for the trip to Seattle. 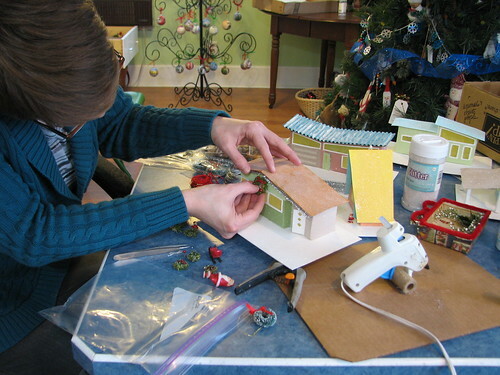 Julie will add Christmas embellishments, driveways, sidewalks, and landscaping. She plans to set up her own little cul-de-sac on a shelf where the kitty can’t get to them. It was wonderful to get back into the craft room and spend time with another craft enthusiast! Thanks for all the fun, Julie! If you would like to see how my DDIL set these up in her own home, click the link. 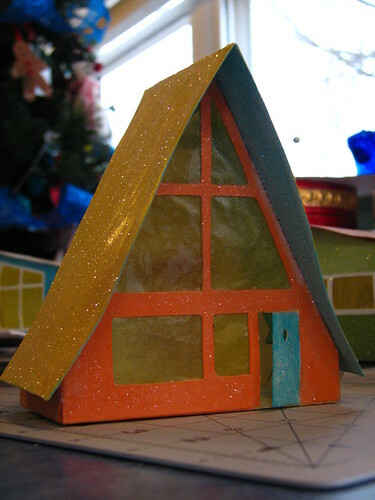 This entry was written by ~~Rhonda, posted on December 14, 2014 at 1:37 am, filed under Christmas, Putz / glitter houses. Bookmark the permalink. Follow any comments here with the RSS feed for this post. Post a comment or leave a trackback: Trackback URL. 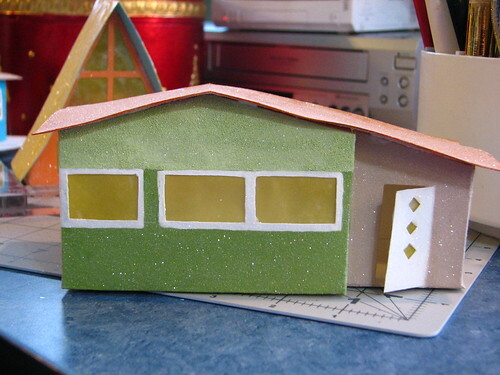 Hi Rhonda, this is Pam from Retro Renovation — your putz houses are ADORABLE!!!!! !